On my friend’s couch; with a stubby of Old Mate Pale Ale followed by a Footscray Ale, we feel it. After Vika and Linda’s glorious a cappella, we feel the rumble. For all the romance of a fairytale; for all the unlikelihood of David besting Goliath; for all the blessed emotional Dogs during the week; for the retweeting of images of Franco Cozzo; for Matt flying in for the game and Almanac lunch from San Francisco; for Dean getting a seat at the game with his Mum; for the love of Bob Murphy; for the stories that Bob Murphy’s parents themselves told at the Footy Almanac Grand Final Eve lunch; for wave after crashing wave of emotional investment and belief, for all that; we feel the rumble of footy. For, whether because of, or despite being impossibly charged on an explosively flammable rocket fuel of emotion, this is an annually scheduled footy game of unique worth. Of unique mythology. Of characters immortalised. Of deeds forever remembered. A Grand Final. And as the last notes of this national anthem are tribally displaced from earshot, with a sense of theatre already well present in the arena, a new sense of football takes over for the first time in a week. After a week crammed with speculation, imagination and adulation. The 99,900 at the ground. Me with mates on a Geelong West couch. Friends in Geneva, up early to the pub to watch. It is J Kennedy as He-Man, arriving at Castle Greyskull. It is L Parker as Clark Kent, unbuttoning the top three buttons and striding it out. It is M Bontempelli as Pat Rafter, racing the net for a diving backhand volley. It is D Morris as Bob the Builder, hard hat affixed. It is soaking, sapping, lead-changing grind and run and tackle and burst. And when it can’t go on any longer – it does. Two hours later, screaming, yelling, riding the bumps. Swans, too, with their reasons. And dark has been the road. Each of us navigating our own darknesses. For what appears as dark for one, is light for another. And who can truthfully tell what lies around the next corner? 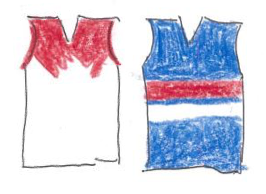 “Totally crying here” – message from a pub in early morning Geneva, from a Melbourne friend –abroad, having kept her interest in footy well concealed for the past 10 years. “Lake is freezing” – a later message from Geneva where an early morning skinny dip seemed the only logical next course of action. Scrabble, bacon, eggs, a Sunday paper of preposterous red, white and blue. “Footy is about these things. It confirms your suspicions that there is something more. It alerts you to the existence of the soul. It invites you to be faithful and loyal. It demands you be faithful and loyal. And just when you are doubting it you see a game which makes you realise why you are so enthusiastic about it. You see courage, you see commitment, you see personal sacrifice, you see skill and you see beauty and you are uplifted. Footy is one of the few places in contemporary life where you experience the transcendent. Footy is also about suffering and suffering can be uplifting. Suffering is the natural state. It is honest. And how we respond to that suffering is elemental. Suffering can bring us together and it is only when we understand the suffering of others can we understand the fullness of joy. There is instead T Boyd, L Dahlhaus, M Bontempelli, J Roughead, D Morris, T Liberatore. There is L Picken. There is S Biggs, T McLean, M Boyd, Z Cordy, C Smith, C Daniel. There is F Roberts, T Dickson, J Dunkley, J Stringer, J Hamling, There is E Wood. There is L Hunter, J Johannisen, J Macrae, everyone at the team; the club. There is L Beveridge, R Murphy. There is J Schultz. There is belief, there is footy. lovely lovely lovely. am reading Tolkien with the elder, and eyeing McCarthy again for myself. oh, and then there was the football game, we were 20 or so “fans of others teams” cheering with the 4 or so actual Dog fans at the Warren View in Enmore, up against about 1000 Swans fans, who were typically quiet until Buddy got them close, then quiet again. see the picture of Antony Green, taken in the first quarter, for the general feel. makes a Tiger dream that next year will be the year. next year is ALWAYS the year! Thanks P Warrington, P Hille. Love this Dave! I want to save those quotes! Top form ER. Great quotes capturing the overall goodwill that the Doggies triumph brought to the game. Even most Swans fans were relatively gracious. A story for the ages. Love the quotes E Regs, Particularly Tolkien – had him labelled as a swords and elves kinda guy. Thst’s the trouble with relying on the Hollywood Cliff Notes versions! Are you that well read with a photographic memory and endless index cards? Or do you have a top secret Google app for lit crits? Stories of hope and possibility are fairly abundant, I guess. My memory for detail is appalling – but the detail can always be found later. Truth is indeed stranger than fiction, e.r. Excellent OBP except I am about to go to bed and I can’t get the bloody words of Bob the builder can we fix it yes we can etc out of my brain ! Er- as usual you distill footy magnificently. In a novel that’s cover to cover with quotables, you’ve picked out a Gatsby belter. It works a treat in your piece. Terrific work. Great references. The lunch, the game, the presentation and then these amongst many great words. It past couple of weeks feels like it has been a lovely time. Like the way things could be. In the absence of vitriol and teeth-gnashing and individuals-placing-themselves-before-the-group. In a world where effort is celebrated. Collective effort and having a go. About time Castle Greyskull got a mention in an Almanac article.